I would like to hear readers views? Has the Canary had it’s way? The year you’re living in, 2013, may be the year that it happened. What is it? It is the onset of global cooling. How dare I make such a mental leap? How dare I not would be an equally good question. 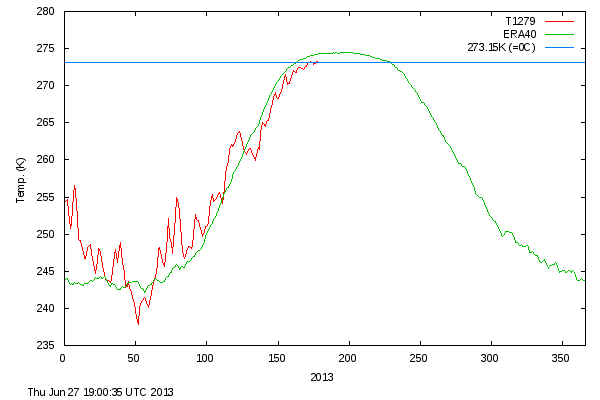 According to the Danish Meteorological Institute, 2013 is the first year since 1976 when Arctic temperature readings north of 80 degrees latitude sat below the zero-anomaly line, what some would call “normal,” for more than 50 days straight. Getting close to 60, in fact, according to my highly scientific eyeball reading of DMI’s graph that you can click on yourself. Go ahead, click through the last few decades. Are you seeing what I’m seeing? I feel we could be in for 1-3 more years of plateau before the trap door opens. However I read an article at Ice Age Now that there could be frost in Germany the next few days. Also your prior article of trapped animals has me cautious. Note to self buy more freeze dried food. Also looking at food dehydrators never can be to prepared. You do not have to be faster than the bear just don’t be the slowest person in your party.